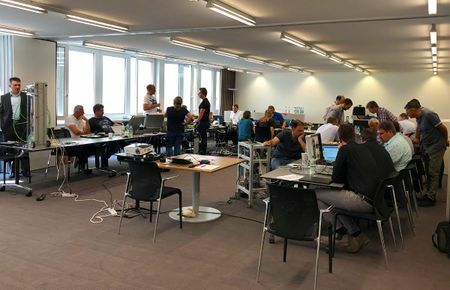 On 4th + 5th September 2018 at the PlugFest of the CANopen SIG Lift representatives of 20 companies from 9 countries met in Nuremberg to test the interoperability of their devices based on the CANopen-Lift standard. For the first time with the company Bucher Hydraulics AG a manufacturer of hydraulic drives was present. In the future the drives of hydraulic elevators can also be controlled in velocity and in position mode based on CANopen-Lift, meaning that direct drive without a step will also be possible with hydraulic elevators. The next CANopen-Lift PlugFest is planed in Nuremberg in April 2019.